One of the world’s foremost bird watchers — whose discoveries have helped to spark eco-tourism booms in his native Isles of Scilly and New Zealand — is in Bermuda this week getting a close-up look at the Cahow and other local species. Bob Flood’s summer sightings of rare seabirds on the British islands of Scilly has made it a must-visit destination for European bird-watchers because of its reputation for attracting rarely-seen species. Twenty-eight miles out into the Atlantic from Land’s End, the islands draw visitors for boating expeditions to view rare birds at sea. In 2003 Mr. 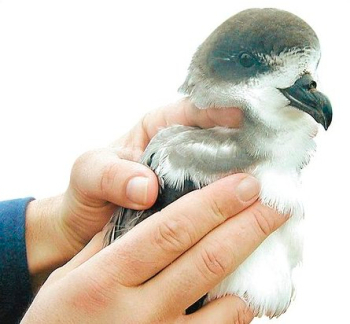 Flood and a colleagues travelled to the other side of the world and confirmed the continued existence of the New Zealand storm-petrel — known only to science from fossils and three museum specimens shot in the 1800s. This also sparked a new tourist boom — looking for the species they re-discovered is now an essential part of eco-tours in New Zealand. “General birding is pretty good in Bermuda,” posted at his blog. “Haven’t ventured far, but highlights so far include: Black and white warbler, Ovenbird, Northern Parula, Northern Waterthrush, White-eyed Vireo, Belted Kingfishes, Eastern Bluebird, Great Kiskadee, Green Heron, Cedar Waxwing etc. Champing at the bit to get out to sea for the Cahow! Bermuda’s national bird, the Cahow — or the Bermuda Petrel — is endemic to the island. The Cahows’ eerie nocturnal cries stopped the early Spanish seafarers settling the islands out of superstition, as they thought the isles were inhabited by devils. Following Bermuda’s colonisation by the English, introduced species like rats, cats and dogs, and mass killings of the birds by early colonists decimated numbers. Despite being protected by one of the world’s earliest conservation decrees, the Governor’s proclamation “against the spoyle and havocke of the Cohowes,” the birds were thought to have been driven to extinction in the 1620s. In 1951, 18 surviving nesting pairs were found on rocky islets in Castle Harbour, and a programme was set up by Dr. Wingate to build concrete burrows and wooden bafflers for the nesting tunnels. On Monday [Nov. 14] Mr. Flood got his opportunity to go to sea and spotted Cahows flying off the island. “We did well today, with one Bermuda Petrel reasonably close at about 4 pm, but the sun was strong and not good for video,” he said. “We had one bird around the boat at dusk. “Otherwise a quite nice mid distance view of two courting birds and quite a few distant views. “We are going out again on Thursday leaving at 2 pm, hoping for even better views at sea. “Tomorrow [Nov.16] I am promised a trip to Nonsuch Island to observe the conservation work, managed by Jeremy Madeiros, and to video birds in the hand. Mr. Flood, a former academic career, but now earns his living from leading groups of bird-watchers on cruises.